Marquee Styled Rectangular Aluminum Door Canopies forty-eight inches and sixty inches wide available with a forty and forty-eight inch projections. These door canopies are all painted white with baked on enamel and require a minimum of ten inches of clearance above the door for mounting. Three inches of insulation are sandwiched inside the forty-eight inch width panel to help reduce any pinging noises such as those caused by falling rain. You will find these no rust marquee styled rectangular aluminum door canopies to be sturdily built. 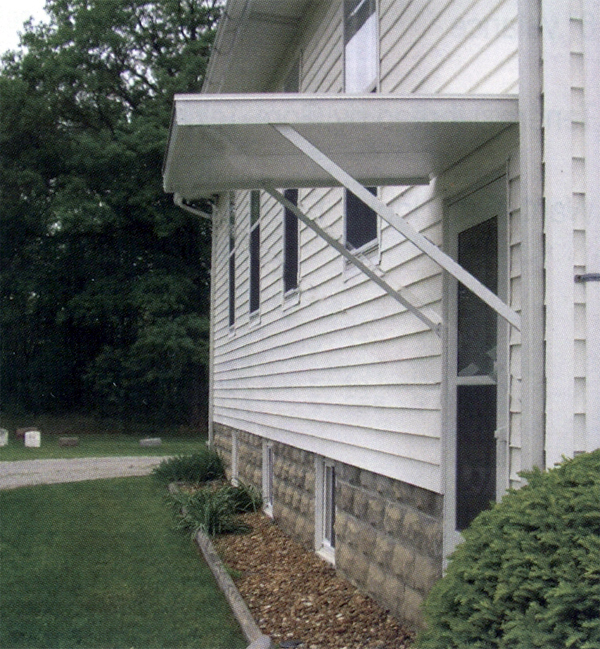 These aluminum door canopies are designed to last and stay looking like new without a tremendous amount of maintenance. A little soapy water is all that is required to keep them looking like new. Over time they are one of the least expensive forms of awnings when you add in their consistent good looks and lack of deterioration. Shelter from the elements, protection from the sun, cooling properties and a nice looking accent for your home are all the great benefits derived from these moderately priced aluminum door canopies. Please note that these rectangular door canopies require a minimum of ten inches of clearance above the door for mounting purposes.